Paul Wackers and Jessica Hans @ Park Life Gallery. Nov 21 - Dec 22. Park Life is excited to announce the opening of Earth Wizard, an exhibit of ceramic sculptures and works on paper by Paul Wackers and Jessica Hans. 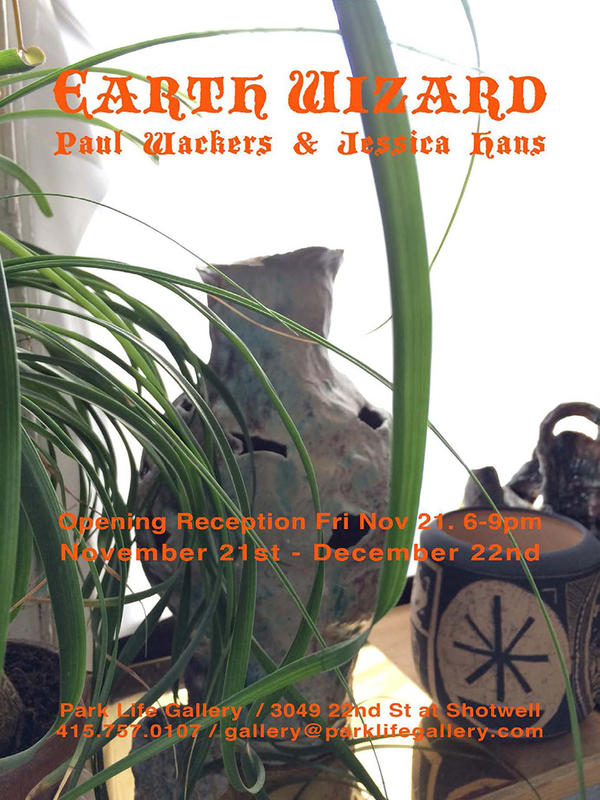 Opening Reception Friday, Nov 21, 2014. 6-9pm. NY based artist Paul Wackers will be debuting a body of ceramic sculptures as well as new works on paper. Wackers’ ceramic sculptures offer a new dimension to his work, giving life to elements found in his intimately painted compositions; potted plants, objects and personal collectables, and abstract moments. Philadelphia based artist Jessica Hans’ colorful, mishappen pots and sculptures are inspired by her love for plants, landscapes, and textiles. Her creations also reflect a shared connection with geology, minerals and deep sea life. This exhibit is made possible with the cooperation of Eleanor Harwood Gallery where Paul Wackers’ Solo show of new paintings opened on Nov. 8.